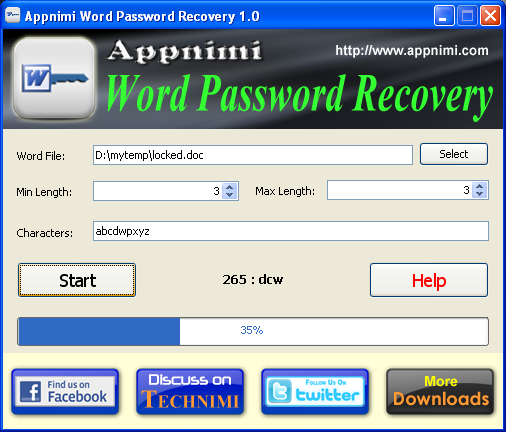 Appnimi Word Password Recovery is designed to let you search for passwords of protected Word documents. Appnimi Word Password Recovery guarantees the most complicated Word passwords recovery. Appnimi Word Password Recovery allows to search for the password of the protected Word using Brute Force algorithm. Appnimi Word Password Recovery can be used by both a normal user who has forgotten his/her password or even forensic engineers. * Run "Appnimi Word Password Recovery" using one of the shortcuts on desktop or in the startup menu. Qweas is providing links to Appnimi Word Password Recovery 1.0 as a courtesy, and makes no representations regarding Appnimi Word Password Recovery or any other applications or any information related thereto. Any questions, complaints or claims regarding this application Appnimi Word Password Recovery 1.0 must be directed to the appropriate software vendor. You may click the publisher link of Appnimi Word Password Recovery on the top of this page to get more details about the vendor.